Quezon City – It’s Saturday and Emar is hurrying to join a basketball game with his friends from high school. Now 33 years old, he still actively plays every weekend with people who share his passion for the sport. “I’ve enjoyed playing this game since I was in high school, and it developed into a hobby. I even joined tournaments with my friends. I get to bond with them as well, so it served a double purpose for me,” Emar added. Basketball has been played by Filipinos since the early 1900s, when it was first introduced by the Americans in the country. The US-born sport has thousands of fans in the Philippines who avidly follow the National Basketball Association (NBA) played in the United States. After the first ever basketball tournament held in Intramuros, Manila, Filipinos reigned the court in the whole of Asia up until the 1960s. In many parts of the country, whether in street corners or residential estates, whether in rural areas or in the city, a makeshift basketball court is a common sight. Billboards and print advertisements featuring basketball players are visible in main streets, especially in the bigger cities. The Manila YMCA and the Bureau of Education incorporated the sport in the Physical Education programs of all colleges and universities. These efforts paid off, making basketball famous in many provinces. According to the 2008 Sponsorship Intelligence Report, an estimated 81% of the urban population in the Philippines are basketball aficionados, making it the number one sport in terms of viewership and participation. The 39th season (2013–2014)of the Philippine Basketball Association (PBA) aired on national TV attracted more than 53 million viewers, making it the most watched sport in 2014, despite numerous other major sporting events aired in the same period. The country’s obsession with basketball is not exclusive to male players. Perlas Pilipinas, the Philippines woman’s basketball club, is slowly gaining followers and inspiring other female ballers. The squad aims to establish a women’s basketball league someday to boost their level of play and be competitive in international competitions. After outplaying India in the recently concluded FIBA Asia Women’s Championship held in Wuhan, China, Perlas Pilipinas is now officially promoted to Level I and will play against the likes of Japan, South Korea, and China in the 2017 edition of the tournament. Football is to Brazil as basketball is to the Philippines. People of different sizes and shapes get into it. Although the average Filipino is no match to the towering statures of NBA stars, the Filipino teams' confidence, spirit, and passion allow them to win games and continue to chase their dream. This exceptional affection for the sport was apparent two days after typhoon Haiyan hit Tacloban, Leyte. One of the first things rebuilt after the storm was a basketball hoop, put up by a barangay chairman who wanted to use basketball to heal the Taclobanons from the horrors they have encountered. Professional basketball tournaments and smaller leagues run through majority of the year. Countless young and striving players join university leagues hoping to later break into the PBA, the second oldest basketball league in the world after the NBA. 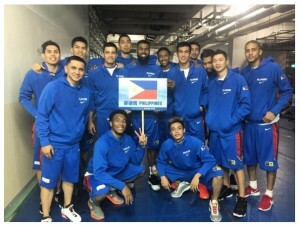 Gilas Pilipinas, the national men's basketball team of the Philippines, is ranked 31st in the world by FIBA and is currently competing in the 2015FIBA Asia Championship in China. Filipino fans are celebrating a victory over Japan, and the Philippines is set to challenge host country China for the title and a ticket to next year’s Olympic basketball tournament in Rio de Janeiro, Brazil. Basketball will always be a part of Filipino identity, and the sport will be here to stay for as long as thousands of passionate fans are cheering and supporting in every home, barangay, and city. Basketball, football, and mixed martial arts, are three of the major sports with a growing number of followers within the past three years, as evidenced by their millions of television viewers. As for Emar and his friends, they will continue to play the game for as long as they can, “even if it seems unlikely that we will ever make it to be pro athletes or see our idols make it to the NBA league,” he added.